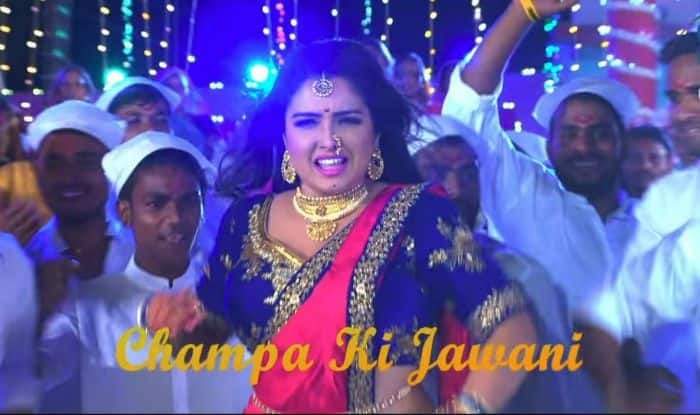 Bhojpuri bombshell Amrapali Dubey’s item song ‘Chicken Biryani Champa Ki Jawani’ from ‘Nirahua Hindustani 3‘ released in October, is creating waves on YouTube. The hot actress is back to charm everyone with her sensational dance moves and sizzling avatar. ‘Nirahua Hindustani 3‘ stars Dinesh Lal Yadav aka Nirahau and Amrapali Dubey in the lead role. The song has become a rage on social media as it crosses over 2.8 million views on YouTube. The song is sung by Kalpana, penned by Aazad Singh and the music has been composed by Rajnish Mishra. In the ‘Chicken Biryani Champa Ki Jawani’ song, Amrapali is donning a Maharashtrian red and blue saree. She looks gorgeous as she styles the look with traditional golden jewellery. The bombshell has amped her look with a tiny golden waist chain that accentuates her beautiful curves. Looking at Amrapali flaunting her dance moves in the song, one can understand why she is the reigning queen of Bhojpuri film industry. In the film, Amrapali Dubey will be collaborating once again with Nirahua. They are known as one of the most hit on-screen couples. Their chemistry is loved and adored by the audience. Nirahua and Amrapali have worked together in films like Border, Nirahua Hindustani 2, Nirahua Saral Rahe, Beta, Mokama 0 km, Ram Lakhan, Bam Bam Bol Raha Hai Kashi, Nirahua Chalal Sasural, Raja Babu and many more. Currently, Amrapali and Nirahua are gearing up to take the digital world by storm. They will make their web-series debut in ALTBalaji’s first-ever Bhojpuri show Hero Vardiwala. The web-series, which will be written and directed by Mahesh Pandey, will also feature Karan Pandey, Vikrant Singh Rajpoot, Sanjay Pandey, Vinod Mishra, Kanak Pandey, Manoj Singh Tiger and Priyanka Pandit aka Gargi in pivotal roles.